The people who taught my daughter and son in middle school, good and competent teachers, never used picture books, to my knowledge. Right now, this minute, most teachers face intense pressure to demonstrate rigor and grade-level competence. I would be thrilled to hear about a sixth-grade teacher in my town, using picture books or urging students to include them in their own reading. I know it’s improbable. On the other hand, the teachers who taught me how to teach, and the colleagues who challenged and nurtured my teaching spirit, all used picture books in inspired ways. I can’t imagine the life of each class community in which I was honored to work and breathe, without picture books. It’s amazing what is controversial in this world. Susan Doty and I were setting up our classrooms, chatting now and then. She said, “I think I’ll start the year with Time of Wonder,” a Robert McCloskey book I didn’t know yet. It seemed like a sweeter book than I would usually choose for my cool and savvy 11 and 12-year-olds. Still, I liked it, and tried it out on them. As I read aloud, the room grew quieter and quieter. I could gauge the attention of many of my listeners by their faces; could tell others were with me when they grinned at the book’s very subtle humor. Like all the best picture books, Time of Wonder is powerful and efficient. Reading Time of Wonder together, my class and I shared summer, and summer adventures, and the inevitable ending of summer. We shared what it’s like to listen to adults talking about possible trouble, a hurricane coming. We shared what it’s like to sit with your grown-ups and sing through the storm, and wake up the next day to explore the branches and roots of a fallen tree. A good picture book, like a poem, and like so much of our everyday storytelling for each other, means more than one thing by everything it means. We talked about students’ experiences of a recent hurricane. The book had given us permission to admit to having been frightened–if we were–along with a model of opportunities for discovery everywhere–and we had had those, too. Two kids, two women who are sisters, a wonderful adventure with danger and glory, and a cat named Sixtoes waiting back at home for an offering of fish. 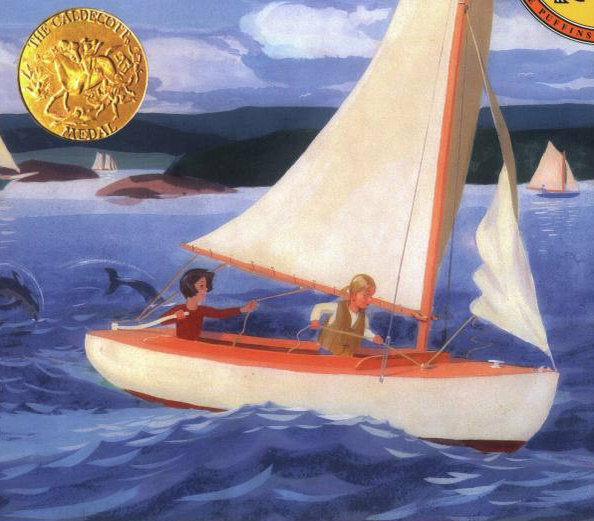 Some years, though, the canoe book waited with others to be chosen by individual students, out of a crate full of books brought from home, from my family’s picture book collection. That crate supplemented the classroom’s shelf of picture books, and another bin of books borrowed from the school library, and another from the public library. All together, kids could choose from an enriched and enlarged collection, in the two or three weeks at the start of the year when everyone read picture books during silent reading time. That happened by my decree, a rare state of affairs which always met with some initial resistance. At home, for their official homework reading time (and, of course, in any additional time they spent curled in a tree or a favorite chair, or walking around a safe path in an open room) they could read the big thick fantasy novels in which they were immersed. In school, though, for those first few weeks, I needed to watch them choose, begin, read, finish, and pass along book after book after book. It’s true that I felt grave concern about a real and present danger: without my intervention, students might get to adulthood never having read highlights of English literature such as Go, Dog. Go! by P. D. Eastman–or never having read them with their new-found, big-kid powers of observation, and sense of irony. 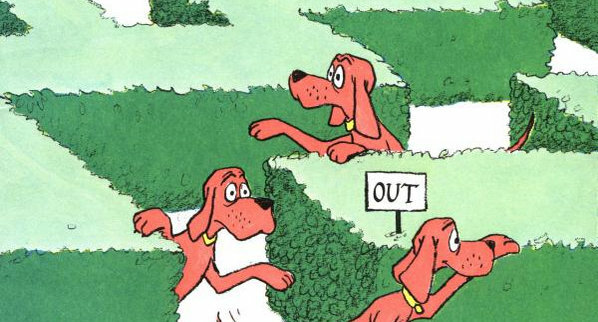 We needed picture books to help us take ourselves less seriously. We also needed picture books to help us take ourselves more seriously, to take us on an express trip into important questions about life and the world. Several past students remembered Eric Carle’s Very Hungry Caterpillar, in which eating and eating, and growing and growing, result in transformation. Ultimately, picture book season in September worked out well for everyone in the class, partly because many of the books I had gathered were what is known in the trade as “sophisticated picture books”, books definitely intended for somewhat older audiences. Here’s one of many wonderful picture book biographies. This one, by Peter Sis, doesn’t dodge the horror of Galileo’s being put on trial for his life, for saying what he could see. Non-fiction picture books could work well later in the year, too. If a group of students were exploring a topic together, reporting to each other on separate individual readings, the right picture book could enable a strong contribution even from a reader still overwhelmed by long blocks of text. After the first couple weeks, for their individual reading, and for the read-aloud books we shared, the students and I mostly chose novels. I might suggest time with picture books for a student who had left her book at home, or a kid marking time until the next book in his series came out on Wednesday. Often, also, a picture book or two could launch a new thematic study–launch in the sense of full throttle forward. For example, Henry the bear (Henry David Thoreau just barely in disguise) makes a case for his preferred mode of transportation–and a bet with a friend–to prove that hiking to Fitchburg takes no longer than working to pay for train fare. Henry’s argument with his friend opened a thematic study called Transportation Choices. Other picture books helped us think about people with limited access to choice: people in our own world unable to drive due to disabilities or aging–or youth; people in places where a bicycle can change a family’s possibilities. In My Rows and Piles of Coins, by Tololwa M. Mollel, a young boy wants a bicycle not just to ride, but to serve as a mechanical pack animal, getting farm products to market. Before my school opened an older student program, all my 12-year-olds graduated from our school and became immigrants into the cultures of other schools. Immigration made a particularly strong thematic study topic then, and picture books helped focus on the choices made by immigrants, including what they chose to bring–which could mean how they chose to be prepared. Miss Bridie Chose a Shovel follows Miss Bridie across the sea, and then through her life in her new land, where she uses her shovel to plant, to clean up after a fire, to dig a grave. Here she is, walking away without looking back, setting out into her new life with her shovel in hand. There are so many other wonderful picture books I’m sad to leave out. My Place, an amazing book from Australia, which I read aloud almost every year, I’m saving for its own special post. The picture books we used to explore ideas about evolution, ditto. For now, just one more. Almost always, on the last day of school, I read aloud this book. If you were ever in my class, you may remember how we created instant background music for certain pages. Singing the final song, to the tune of Popeye the Sailor Man, was a great antidote for any tendency to get weepy, especially my own. The round shapes visible on many of the books shown aren’t part of the illustrations. They’re just stickers that marked the books belonging to the classroom collection, or my family collection. Time of Wonder, written and illustrated by Robert McCloskey. Puffin. 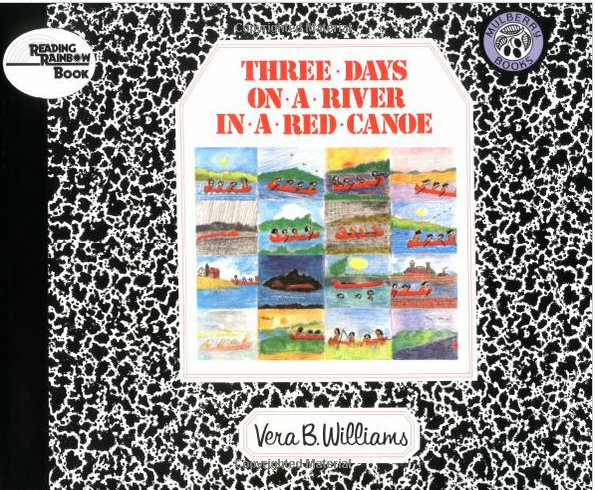 Three Days on a River with a Red Canoe, written and illustrated by Vera B. Williams. Greenwillow. Go, Dog. Go! written and illustrated by P. D. Eastman. Random House. 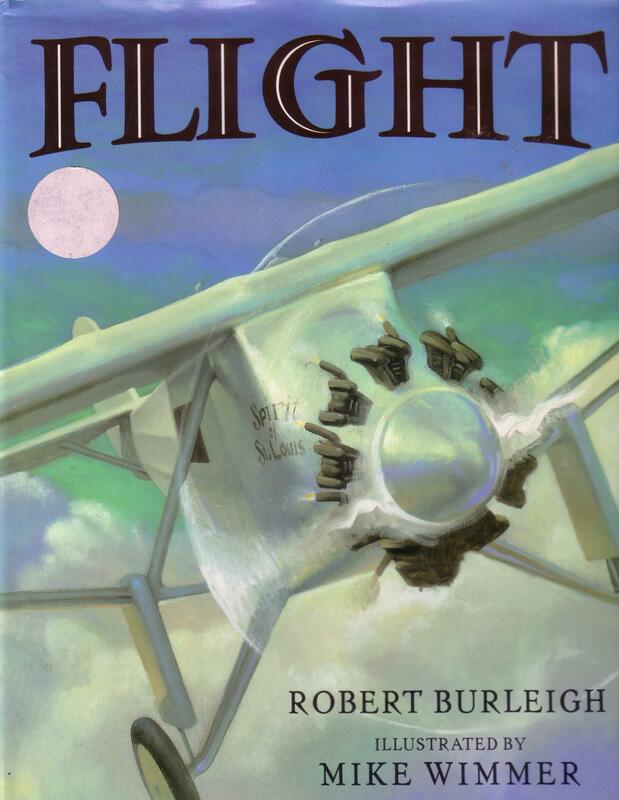 Flight, by Robert Burleigh, illustrated by Mike Wimmer. Puffin. 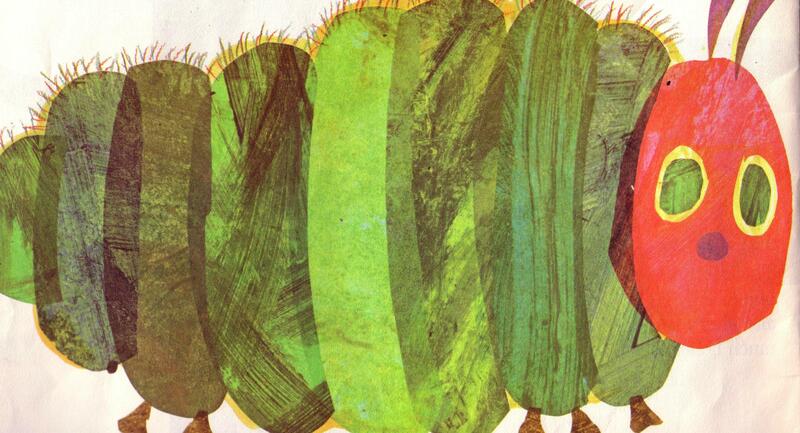 A Very Hungry Caterpillar, written and illustrated by Eric Carle. Philomel. 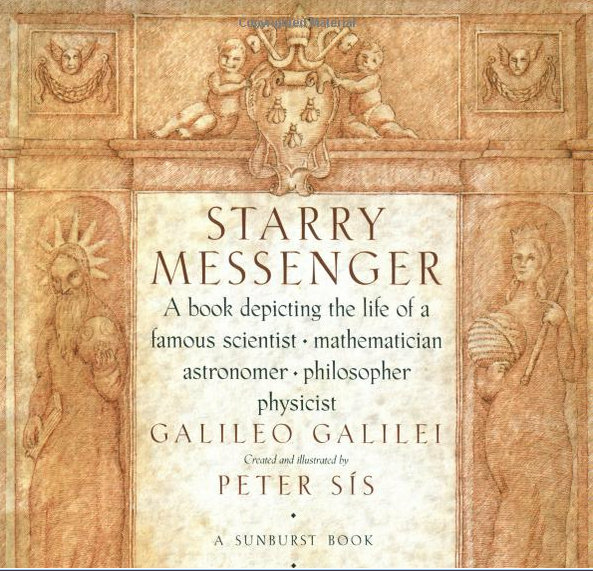 Starry Messenger: Galileo Galilei, created and illustrated by Peter Sis. Square Fish. 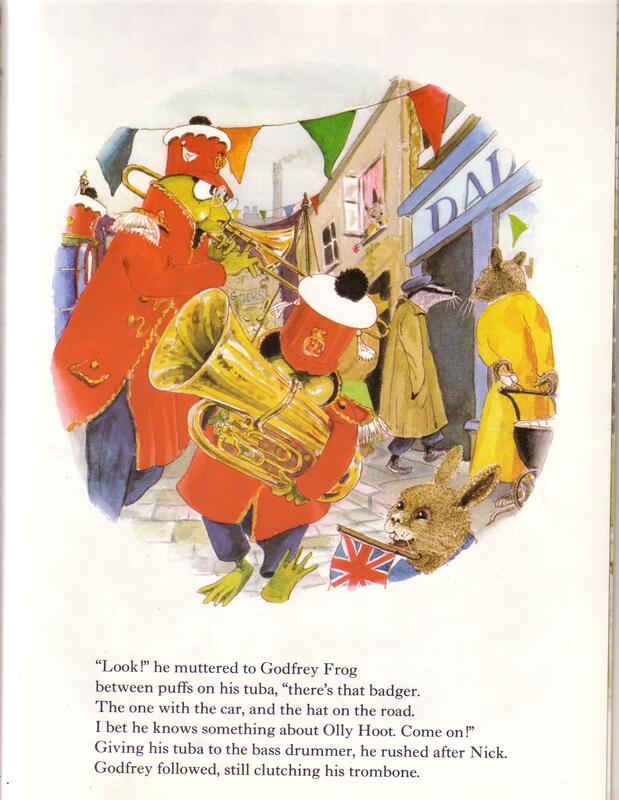 The Frog Band and the Owlnapper, written and illustrated by Jim Smith. Little Brown. 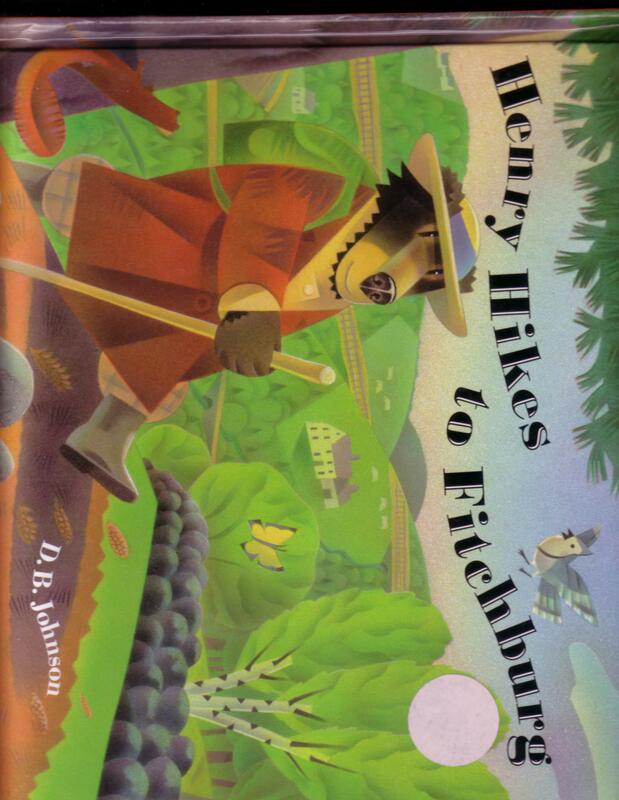 Henry Hikes to Fitchburg, written and illustrated by D. B. Johnson. Houghton Mifflin Harcourt. 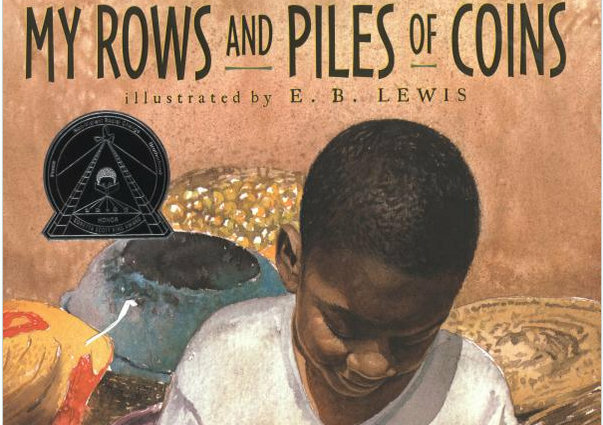 My Rows and PIles of Coins, by Tololwa M. Mollel, illustrated by E. B. Lewis. Clarion. 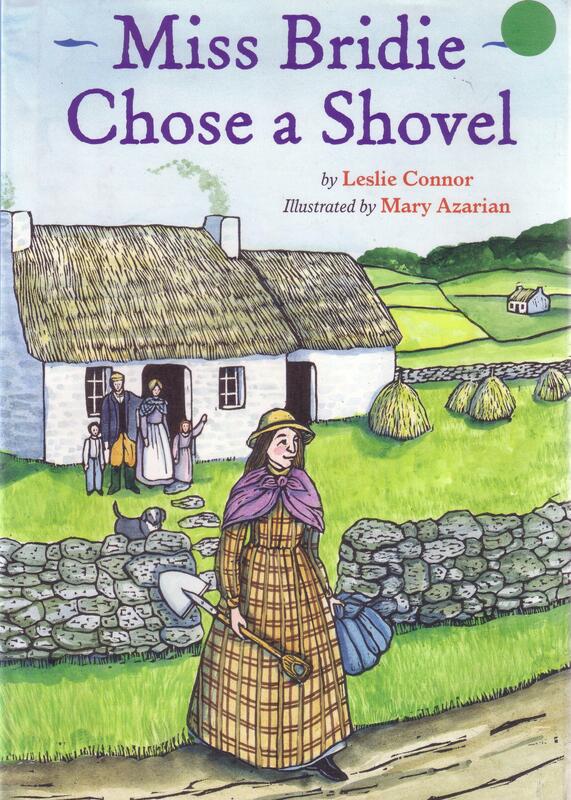 Miss Bridie Chose a Shovel, by Leslie Connor, illustrated by Mary Azarian. Houghton Mifflin Harcourt. 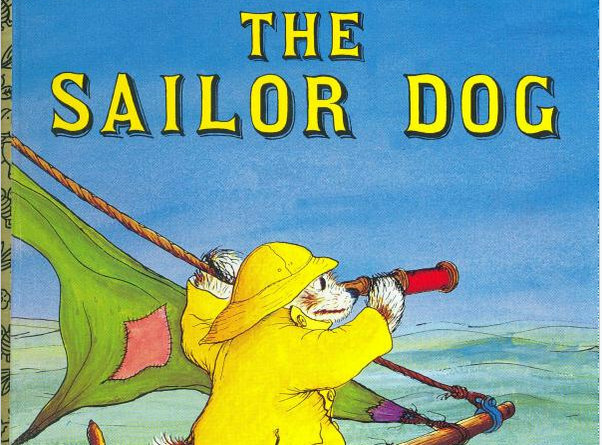 Sailor Dog, by Margaret Wise Brown, illustrated by Garth Williams. Golden Books. This entry was posted in Class life, Integrating the arts, Reading and writing, Teaching life, Technology and tagged A Very Hungry Caterpillar, Flight, Go Dog Go, Henry Hikes to Fitchburg, Miss Bridie Chose a Shovel, My Rows and Piles of Coins, picture books, reading community, Sailor Dog, Starry Messenger: Galileo Galilei, The Frog Band and the Owlnapper, Three Days on a River in a Red Canoe, Time of Wonder, using picture books with older readers, using trade books in the classroom by pollybrown2013. Bookmark the permalink. What a lovely posting, Polly! As a former classroom teacher (grades 1-5) and forever poet, I am OBSESSED with children’s picture books! I can’t stop myself from finding and buying them for future grandchildren 😉 My daughter, who teaches now, and my daughter-in-love, a writer, editor and illustrator, are also such book lovers. So many lessons for “kids” of all ages. Thanks for some great memories of the books you’ve featured. and Lester’s “John Henry” for it’s beautiful language.